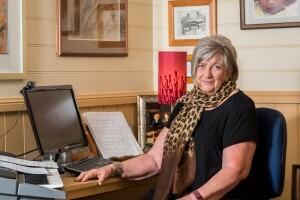 Ann Carr-Boyd is an internationally acclaimed Australian composer whose music is truly Australian, but embraces her close connection with European music through her family of professional musicians from Bohemia. Her musical style is often classed as ‘chameleon’ and is the outcome of this inheritance. The European influence is evident in her music which is recognised for its romantic harmonies, adherence to classical form and Australian inspiration. “The Bells of Sydney Harbour”, composed for the opening of the new Ron Sharp organ in the Sydney Opera House. “Images of Australia”, composed for the ABC television documentary marking the bicentenary of European settlement in Australia. The orchestral work “Look at the Stars”, performed by the Australian Youth Orchestra at the opening of the new Parliament House in Canberra. “Beneath the Yellow Moon” in the ABC Classic FM radio series “Images of our Times”. These landmark events, plus the constant presence of her music in radio broadcasts and concerts and the popularity of such works as Fandango for mandolins, have made her music well known and loved. 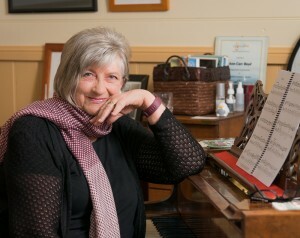 For the last 20 years Ann’s piano, flute, cello and other instrumental music have been part of the Australian Music Examinations Board (AMEB) syllabus. Joan Sutherland Performing Arts Centre: Sydney Symphony Fellows gave several concerts of Ann’s new chamber works which also included her piano and vocal music. Southern Highlands of New South Wales, Canberra and Goulburn all hosted concerts to celebrate Ann’s ‘coming of age’. State Library of New South Wales: A concert ‘Four Generations of Music’ was held 2008 with a program featuring her music performed by John Martin, piano, as well as music by her grandfather Albert Wentzel and father Norbert Wentzel, performed by her daughters Xanthe and Katrina and niece Alexandra Wentzel, and also Victoria Jacono, viola.